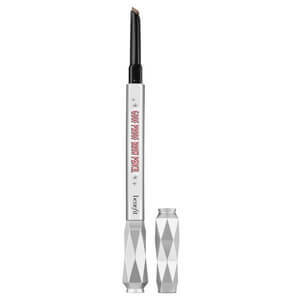 Solve your brow dilemmas with benefit Brow Contour Pro Pen; two shades of brow pencil, an arch highlighter and an edge definer in one convenient tool. 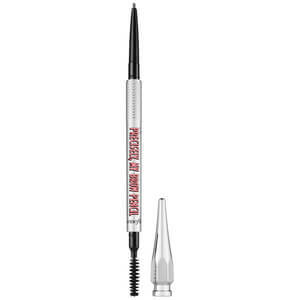 The four-in-one mechanical pencil allows you to create perfectly shaped eyebrows with depth, dimension and professional-looking results. Available in a range of shades to suit all hair colours and skin tones. Step 1: Fill in brow with lighter shade from start to arch. Step 2: Fill in brow with darker shade from arch to end. 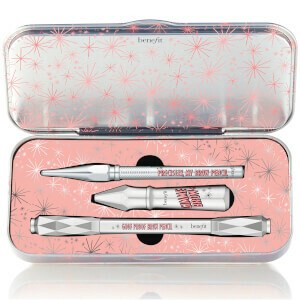 Step 3: Stroke definer below brow from start to end and above brow from arch to end. Blend gently. Step 4: Apply highlighter directly beneath arch and blend outward. To switch shades, just press down tab of selected shade until it clicks in place and twist for product. Synthetic Fluorphlogopite, Polyglyceryl-2 Triisostearate, Dimethicone, Polyethylene, Neopentyl Glycol Diethylhexanoate, Calcium Carbonate, Cera Microcristallina (Microcrystalline Wax), Copernicia Cerifera (Carnauba) Wax, Sorbitan Sesquiisostearate, Aluminum Hydroxide, Tocopherol, Bht. [+/-: Ci 19140 (Yellow 5, Yellow 5 Lake), Ci 42090 (Blue 1 Lake), Ci 77007 (Ultramarines), Ci 77163 (Bismuth Oxychloride), Ci 77288 (Chromium Oxide Greens), Ci 77289 (Chromium Hydroxide Green), Ci 77491, Ci 77492, Ci 77499 (Iron Oxides), Ci 77510 (Ferric Ferrocyanide, Ferric Ammonium Ferrocyanide), Ci 77742 (Manganese Violet), Ci 77891 (Titanium Dioxide)]. N° 12311/A.